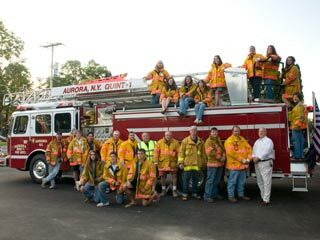 The Aurora Volunteer Fire Department is an all-volunteer fire and rescue organization in Aurora, NY. We are funded by donations and through the Aurora-Ledyard Fire District. According to the National Volunteer Fire Council, 73 percent of firefighters in the United States are members of VFDs. In addition, 45 percent of EMS in this country is fire-based. The AVFD is a dedicated group of local men and women whose mission to save lives and personal property. Please support your local Volunteer Fire Department. The next life we save may be yours. Being a fire and rescue volunteer in Aurora, NY is a uniquely rewarding experience. Our volunteers agree that the greatest benefits of volunteering are the skills you learn, the chance to be part of a close-knit team, and the satisfaction and confidence you gain from serving your community. Applicants must meet certain strict requirements to be considered eligible for membership, and active volunteers are expected to fulfill several participatory, certification, and compliance requirements to remain involved. Attendance at regular departmental meetings and participation in administrative functions (e.g., fundraising) is encouraged. Please include: Name, address, telephone number, and vertical or horizontal orientation. For more information, contact Kevin at 730-6589. The Aurora Volunteer Fire Department is selling house markers to increase the visibility and accessibility of your home. Whether or not you have your house number posted on the side of your house or on your mailbox, these house markers are optimized to make finding your house easier in an emergency. 100% Aluminum - size 6" x 18"
Money from the sale of the markers will be used to fund the AVFD.